Planted Forests and Trees Working Papers report on issues and activities in the planted forests sector. These working papers do not reflect any official position of FAO. Please refer to the FAO website (www.fao.org/forestry) for official information. The purpose of these papers is to provide early release of information on ongoing activities and programmes and to stimulate discussion. FAO. 2006. 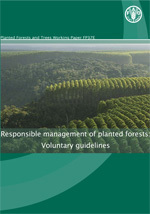 Responsible management of planted forests: voluntary guidelines. Planted Forests and Trees Working Paper 37/E. Rome (also available at www.fao.org/forestry/site/10368/en). Photo credit: Planted forests landscape, Bahia, Brazil, courtesy Veracel Company, Brazil.